While that is mostly true, it really wasn’t the case today. Serena Williams was far from her dominant self… and yet, she still dominated World No. 4 Agnieszka Radwanska 6-2 and 6-4. The Polish No. 1 had plenty of chances to make this match more interesting than it was: she even created 3 more break points than Serena (who served only 56% of 1st serves). 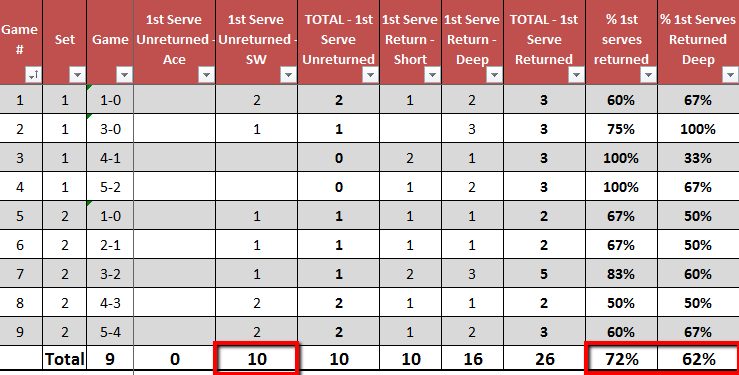 However, Radwanska only converted on one of those 8 opportunities (which came in 3 different service games, an important detail). More importantly, Aga couldn’t find ways to survive the break points on her own service games, as she ended up saving just one of the five Serena created (and she got broken in that game anyway). As you’ll see below, Radwanska put together a very good return of serve performance, and I thought she served well for the most part herself – she ended up with one more 1st serve Service Winner than Serena (10 to 9, actually). Isn’t that remarkable? And yet, it wasn’t nearly enough. What’s worse for Radwanska is that Serena seemed to be on the verge of what I call Despair Mode: the 17-time Major champ looked anguished and nervous for long stretches of the match. This seemed baffling to me, given that facing Radwanska has to be one of the least intimidating match-ups for Serena: the Saginaw native has now won all 8 of their matches, losing only one set in the process. After the match, Serena said that she was tired, and hinted that it wasn’t because of playing yesterday. Which was her 78th match of 2013. At any rate, there is one thing Serena Williams did at a very high level today, and it’s the subject of this post. – Whenever you return 79% of your opponent’s serve, you can tell yourself you had a good day in that department. When you return 79% of Serena Williams’ serves, you had a pretty spectacular day in the office. Notice also that the woman possessing the greatest serve in the history of the sport never held at love, and faced break points (plural) in a third of her service games. – Again, if you can say you played Serena Williams and put back in play 77% of her first serves, you deserve plenty of kudos. However, if those returns weren’t deep, you probably had some problems. This was the case for Radwanska, who managed to get good return depth in only 30% of those returns. That means that Serena Williams had comfortable options after a 1st serve frequently. – Not to sound like a broken record, but again, these numbers are pretty fantastic for Radwanska. Returning 60% of Serena’s 2nd serves deep is quite an accomplishment. You’re probably thinking what I’m thinking: if Radwanska returned serve so well, how did she lose so handily? For one, I thought Radwanska did very little to even try and bother Serena during rallies. Just her standard passivity and occasional trickery. Not a whole lot of purposefulness was on display from her end of the court. What’s worse, Radwanska gave away a couple of the breaks via cheap errors, which is anathema to her already conservative gameplan. And there’s also the fact that Serena Williams did one thing spectacularly well. – Looking at the highlighted pattern in the Outcome column makes me laugh. A few thoughts: 1) None of the 9 Radwanska service games was a “battle:” either Serena broke without much of a fight, or Radwanska held easily. 2) Radwanska held to 15 twice as many times as Serena Williams. – Note how many free points Radwanska got off her first serve. Remarkable, no? It’s been mentioned before that Aga has a frequently effective first serve, and that aspect of it was in full display today. It also helped that the Pole served a gaudy 73% 1st serves for the match. In a related note: tennis establishment, please count service winners. Isn’t a 10 more fun to look at than a O (for Aces)? – The second highlight is the main difference in the match. Even though Radwanska used her 1st serve pretty well, Serena Williams had flashes of pure dominance with her return of serve. Yes, she gave up 10 Service Winners, but she did put in play 72% of those 1st serves. 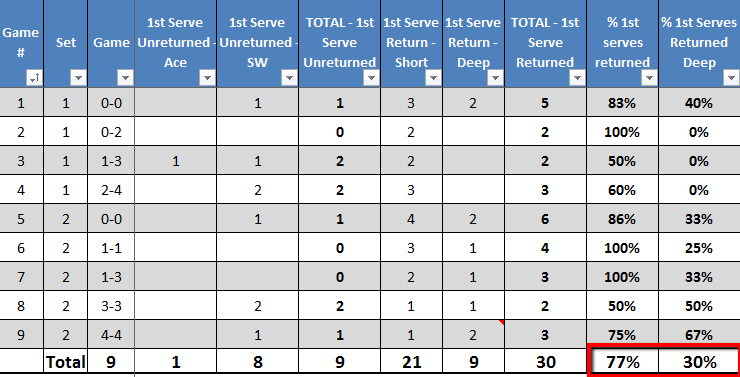 But more importantly, 62% of those 1st serve returns were deep. That’s not merely good: it’s spectacular. And it’s the kind of noticeable difference that hints at why this match (and the head-to-head) is so lopsided in favor of the runaway World No. 1 of women’s tennis. – To summarize: Serena Williams returned 61% of 1st serves deep, and 63% of 2nd serves deep. Agnieszka Radwanska was having to start a point on her own serve from uncomfortable positions over 6 out of every 10 points in which a return was put in play. But that didn’t stop her from returning serve at an elite level. I didn’t watch these matches, so Im not sure why that happened. Does Istomin start off strong then fade? Is there something about his game that is unconventional, that players take a set or so to adjust to properly? Or is this just a random stat that doesnt show anything?